The PET is a functional. fast and precise diagnostic equipment. with 64 slice CT scanner which allows full body PET scans in 20 minutes with 4 times lower radiation exposure than conventional equipment. The bore is 70cm wide for patients weighing up to 485 lbs. The applications of this equipment are used for oncological and cardiac studies, as well as a Treatment – Response evaluation. Dynamic and metabolic studies of Nuclear Medicine with advanced technology that improves the image quality and reduces visual noise. We have the latest in Oncology studies enabling us to perform full body scans in just 20 minutes and to detect lesions of up to 2 millimeters in length. The PET instrument detects where FDG has collected in the body. 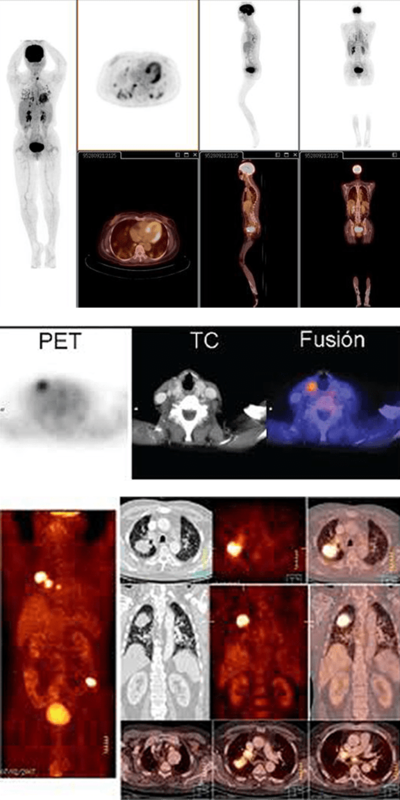 Therefore PET detects the location of metastatic cancer. • Metastatic cancer is made of hypermetabolic cells. • Hypermetabolic cells use more sugar (glucose) than normal cells. • Radioactive glucose (FDG) is injected intravenously. • During this resting period FDG collects in hypermetabolic cells. 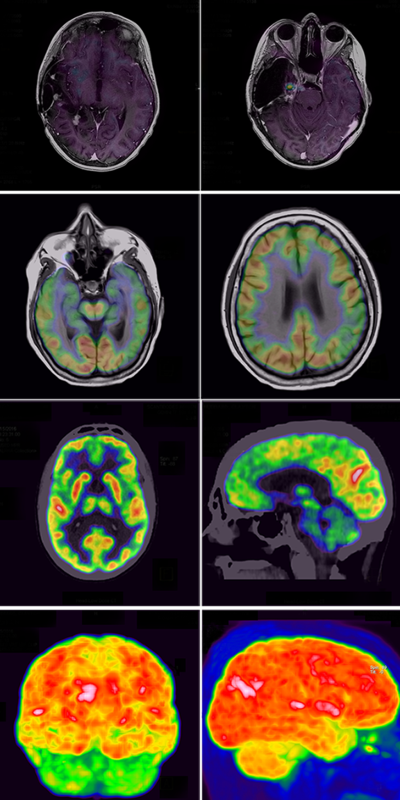 The PET instrument detects the distribution of radioactive glucose (FDG) in the brain, detecting the areas of decrease or increase of metabolic brain activity. • Brain metabolism consumes 25% of the total glucose that the body consumes. FDG or radioactive glucose, allows the detection of normal and abnormal metabolic areas in the brain. • The radioactive glucose (FDG) is injected intravenously. • During the relaxation period the radioactive glucose is distributed in the brain cells. • Table moves patient thru CT scanner (2 min). • Table moves patient thru FDG DETECTOR (for approximately 10 min).